"The process began with the juice extracted from the tips of young shoots of a bush called 'kirar' in Sindhi (Capparis aphylla). The informant then ground washing soda to a fine powder and mixed it with water in a cup. He poured a small quantity of this on the kirar and rubbed the whole carefully together to a semfluid mass. Then the craftsman strained this mixture through a piece of linen into a large empty mussel shell, and the "paint" was ready. Ths paint was applied to a carnelian stone using a reed pen. The painted stone was then allowed to dry, first in the hand, then by placing it on a metal plate over a charcoal fire. When fully dry, the carnelian was covered with live coals and the fire fanned for about five minutes. The piece was then removed from the heat and allowed to cool slowly for about 10 minutes under an inverted cup, at which point the craftsman rubbed his piece of carnelian briskly with a rag and handed it over for inspection. It was perfect!" Carnelian, is a form of chalcedony that has been turned red by heating. It is rarely found in nature. Heating the stone causes the oxides of iron to become yellow, orange and red. It was one of the most popular and widespread semi-precious stones in the ancient Near East and India, and became one of the most valuable stones after lapis lazuli in the manufacture of jewellery and seals. The white etchings on the surface are made with an alkali which is painted on the surface, and leaves a permanent mark when heated. The oldest etched carnelian beads have been found in India and Mesopotamia, but workshops for producing etched carnelian beads have been excavated at Chanhiyun Jo Daro and Lothal, indicating India as the site of origin. Possehl claims that "Etched carnelian was so prized during the Mature Harappan that it generated a market for cheap imitation product. These have been found at Mohenjo-daro, and they are all of steatite or steatite paste." 2) Black decoration on white coloured base. Forty years later, E.C.L. During Caspers and J. Reade distinguished a third type: a black pattern on a naturally coloured carnelian bead. Of these varieties, the white-on-red type was the most common, the black-on-white type was uncommon while the black-on-red type was extremely rare. 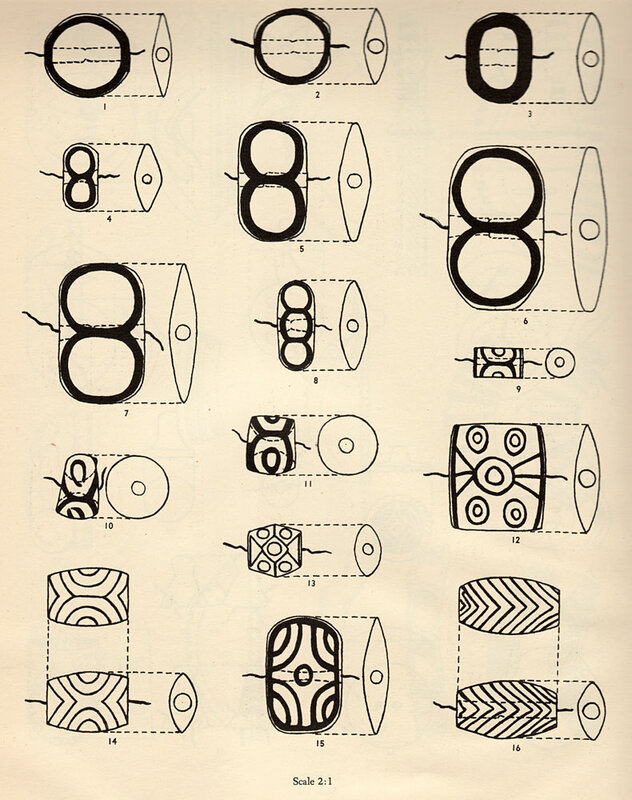 In Chanhiyun Jo daro, the most popular pattern was the figure-of-eight. Beck HC. Etched carnelian beads.The Antiquaries Journal 13: 1933: 384–398. De Waele, An, and Ernie Haerinck. "Etched (carnelian) beads from northeast and southeast Arabia." Arabian archaeology and epigraphy 17.1 (2006): 31-40. During Caspers ECL. Etched cornelian beads.Bulletin of the Institute of Archaeology 8–9. 1972: 83–98. Mackay, Ernest. "150. Decorated Carnelian Beads." Man 33 (1933): 143-146. Possehl, Gregory L. The Indus civilization: a contemporary perspective. Rowman Altamira, 2002. Reade J. 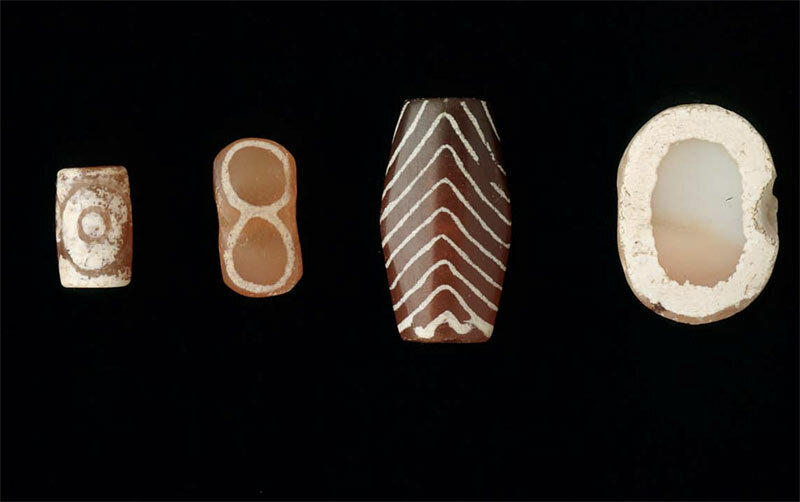 Early etched beads and the Indus-Mesopotamia trade. London: British Museum Occasional Paper, 2: 1979.